Note! According to line one of the equation (1) - the capture velocity is not dependent on the size of duct. This equation can only be used for exhaust outlets with relatively small diameters. Note! 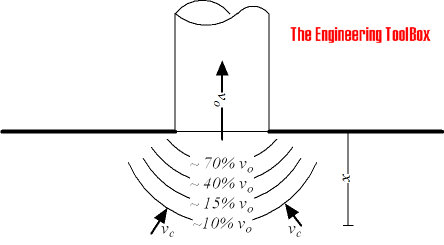 The air velocity in distance one diameter from the duct outlet - is less than 10% of the duct air velocity. 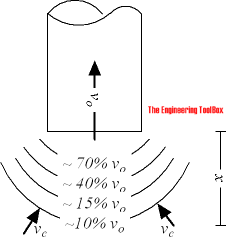 The velocity in distance x from an exhaust outlet can be calculated with the calculators below. The calculator above can be used if volume is multiplied with 1.33. Use of exhaust hoods improves the evacuation efficiency further. Engineering ToolBox, (2005). 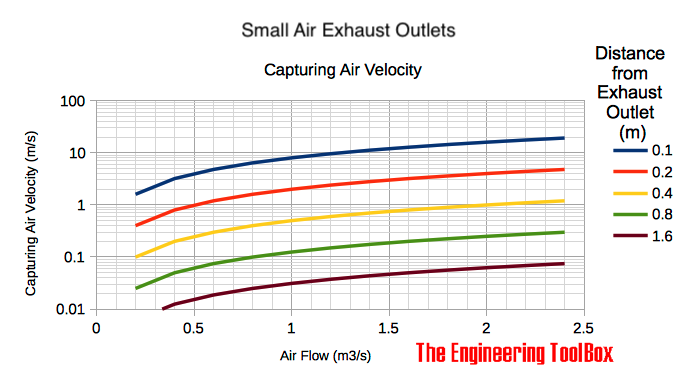 Exhaust Outlets - Capturing Air Velocities. [online] Available at: https://www.engineeringtoolbox.com/exhaust-outlet-d_1008.html [Accessed Day Mo. Year].